Pfc. Alex Colliver, foreground, pulls a 90-pound sled 50 meters that simulates the strength needed in pulling a battle buddy out of harm’s way during a pilot for the Army Combat Fitness Test, a six-event assessment designed to reduce injuries and replace the current Army Physical Fitness Test. Army senior leaders have approved a new strenuous fitness test designed to better prepare Soldiers for combat tasks, reduce injuries and lead to ample cost savings across the service. 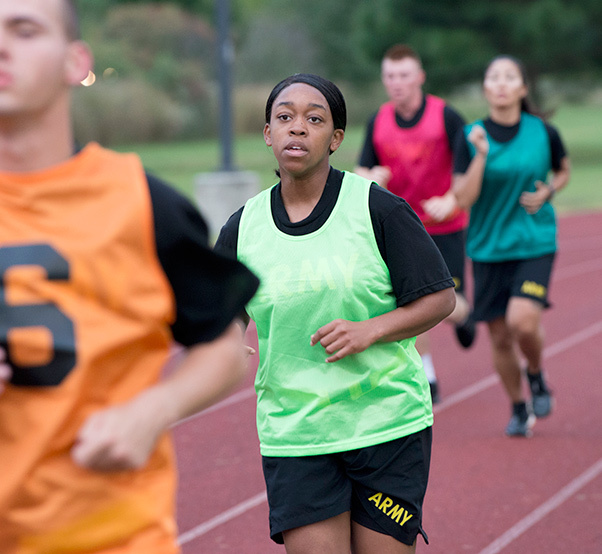 The six-event readiness assessment, called the Army Combat Fitness Test, is intended to replace the current three-event Army Physical Fitness Test, which has been around since 1980. Beginning October 2020, all Soldiers will be required to take the new gender- and age-neutral test. Before that, field testing set to begin this October will allow the Army to refine the test, with initial plans for up to 40,000 Soldiers from all three components to see it. At least six years of significant research went into the test’s development as researchers looked at what Soldiers must do fitness-wise for combat. Sgt. 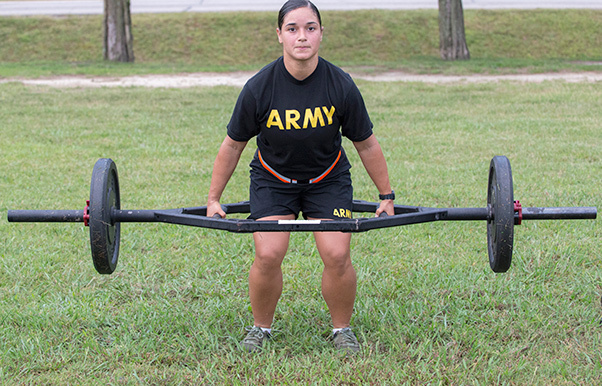 Bruna Galarza demonstrates the deadlift event during a pilot for the Army Combat Fitness Test, a six-event assessment designed to reduce injuries and replace the current Army Physical Fitness Test. Roughly 2,000 Soldiers have already taken the test, previously called the Army Combat Readiness Test. They also provided feedback as part of the Army Training and Doctrine Command and Forces Command pilots that began last year at several installations. Spec. Efren Gandara performs leg tucks during a pilot for the Army Combat Fitness Test, a six-event assessment designed to reduce injuries and replace the current Army Physical Fitness Test. 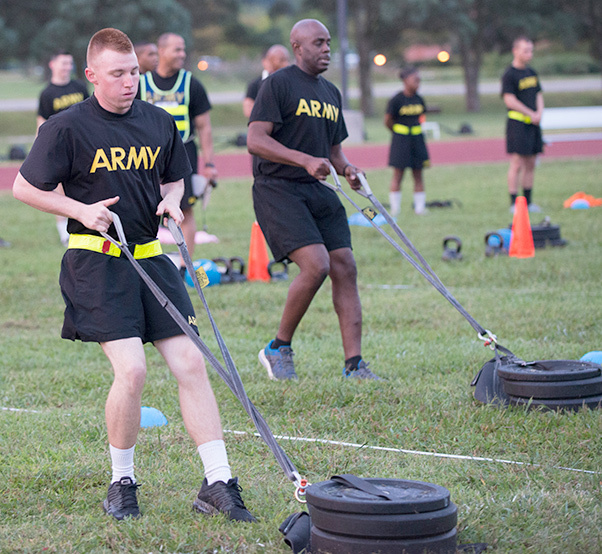 While the ACFT still keeps the 2-mile run as its final event, it introduces five others to provide a broad measurement of a Soldier’s physical fitness. The events are completed in order and can take anywhere from 45 to 55 minutes for a Soldier to finish. * Strength deadlift: With a proposed weight range of 120 to 420 pounds, the deadlift event is similar to the one found in the Occupational Physical Assessment Test, or OPAT, which is given to new recruits to assess lower-body strength before they are placed into a best-fit career field. The ACFT will require Soldiers to perform a three-repetition maximum deadlift (only one in OPAT) and the weights will be increased. The event replicates picking up ammunition boxes, a wounded battle buddy, supplies or other heavy equipment. 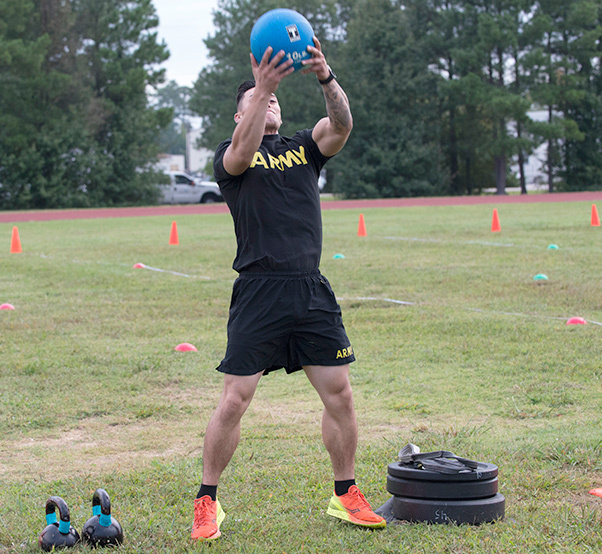 * Standing power throw: Soldiers toss a 10-pound ball backward as far as possible to test muscular explosive power that may be needed to lift themselves or a fellow Solider up over an obstacle or to move rapidly across uneven terrain. * Hand-release pushups: In this event, Soldiers start in the prone position and do a traditional pushup, but when at the down position they release their hands and arms from contact with the ground and then reset to do another pushup. This allows for additional upper body muscles to be exercised. * Sprint/drag/carry: As they dash 25 meters five times up and down a lane, Soldiers will perform sprints, drag a sled weighing 90 pounds, and then hand-carry two 40-pound kettlebell weights. This can simulate pulling a battle buddy out of harm’s way, moving quickly to take cover, or carrying ammunition to a fighting position or vehicle. * Leg tuck: Similar to a pullup, Soldiers lift their legs up and down to touch their knees/thighs to their elbows as many times as they can. This exercise strengthens the core muscles since it doubles the amount of force required compared to a traditional situp. * Two-mile run: Same event as on the current test. In the ACFT, run scores are expected to be a bit slower due to all of the other strenuous activity. 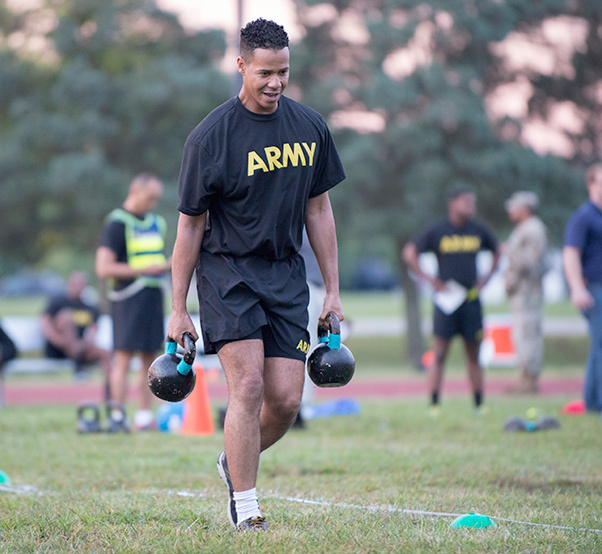 A Soldier carries two 40-pound kettlebell weights during a pilot for the Army Combat Fitness Test, a six-event assessment designed to reduce injuries and replace the current Army Physical Fitness Test. The ACFT gauges Soldiers on the 10 components of physical fitness: muscular strength and endurance, power, speed, agility, aerobic endurance, balance, flexibility, coordination and reaction time. The current test only measures two: muscular and aerobic endurance. The vast majority of policies with the APFT will likely be carried over to the new test. Scoring could be similar with 100 points for each event for a maximum of 600. Minimum scores, however, may change depending on a Soldier’s military occupational specialty. Soldiers in more physically demanding jobs may see tougher minimums, similar to how OPAT evaluates new recruits. “The more physically challenging your MOS, the more you’ll be required to do at the minimum levels,” said Michael McGurk, director of research and analysis at CIMT. Another difference is that there are no alternate events planned for this test, he said. Soldiers will still get adequate time to rehabilitate from an injury. But under a new “deploy-or-be-removed” policy, Defense Secretary James Mattis said in February that troops who are non-deployable for more than 12 months will be processed for administrative separation or referred to the disability evaluation system. Staff Sgt. Joel Demillo demonstrates the standing power throw event during a pilot for the Army Combat Fitness Test, a six-event assessment designed to reduce injuries and replace the current Army Physical Fitness Test. “Generally speaking, somebody who has a long-term permanent profile that precludes taking a fitness test may not be retainable for duty in the Army,” McGurk said. At about $20 million, the new test will be more costly for the Army to conduct. A single lane of equipment at full retail value is about $1,200. A battalion set of equipment will range from $12,000 to $20,000. Those prices will likely drop as the Army buys more sets at wholesale. Equipment should last about 10 years, meaning it will cost less than $3 per Soldier over time. The Army estimates $4 billion is spent each year due to injuries, non-deployable Soldiers, accidents and other health-related costs. 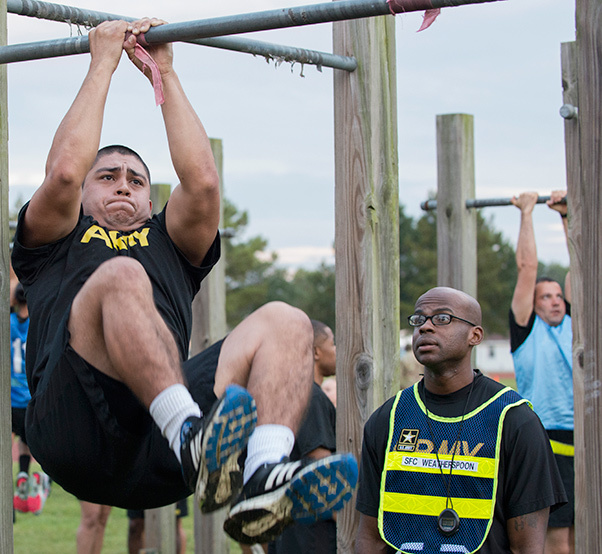 As part of its culture change, the Army is building a Holistic Health and Fitness System to produce healthier and fitter Soldiers. 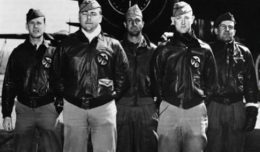 The new test is one piece of the system, in addition to the OPAT, the improvement of fitness centers, and healthier options at chow halls. Army researchers studied foreign militaries that have rolled out similar holistic programs and found them to be highly successful. The Australian army, for instance, introduced it to their basic training and saw a roughly 30 percent reduction in injuries. Feedback from Soldiers so far has also been overwhelmingly positive. Soldiers conduct a two-mile run as part of a pilot for the Army Combat Fitness Test, a six-event assessment designed to reduce injuries and replace the current Army Physical Fitness Test. While some Soldiers may disagree with replacing the current test, McGurk said that fitness has come a long way from 40 years ago when the APFT was first developed. In early June, senior leaders outlined what the Army should focus on over the next decade to retain overmatch against potential adversaries. The 2028 vision statement, signed by the Army’s secretary and chief of staff, calls for modernized equipment, particularly the development of autonomous systems. It also stresses the need for physically fit and mentally tough Soldiers to fight and win in high-intensity conflict. The ACFT is a foundational method, leaders believe, that the Army can use to start a new era of fitness and obtain Soldier overmatch in combat.